healthy function of the brain, peripheral nerves and kidneys, and foster normal premenstrual physiology. 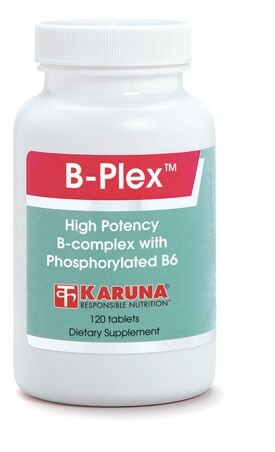 B-Plex is a comprehensive high-potency B-vitamin formulation in a yeast-free hypoallergenic form, containing active coenzyme B6 (pyridoxal-5-phosphate). normal vascular function (J Nutr 1994;124:1927-33; Am J Cardiol 1995;75:132-6). 109(4):489-96; N Engl J Med 1998; 318:170-8). Clinical trials have found vitamin B6 supplements helpful for diverse conditions, such as reducing urinary oxalates that may disturb normal kidney function (Int Urol Nephrol 1988;20:353-9), stabilizing premenstrual physiology (BMJ 1999;318:1375-81), and restoring normal peripheral nerve function (Arch Phys Med Rehabil 1984;65:712-6; J Occup Environ Med 1997;39:949-59). Certain medications, such as oral contraceptives, are associated with depletion of several B-vitamins (Food & Drug Interaction 1998;197-8; Lancet 1975;1:561-4). 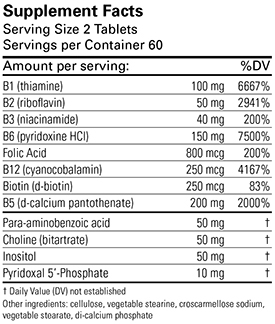 Suggested use for adults: 1-2 tablets taken daily with meals, or as directed.